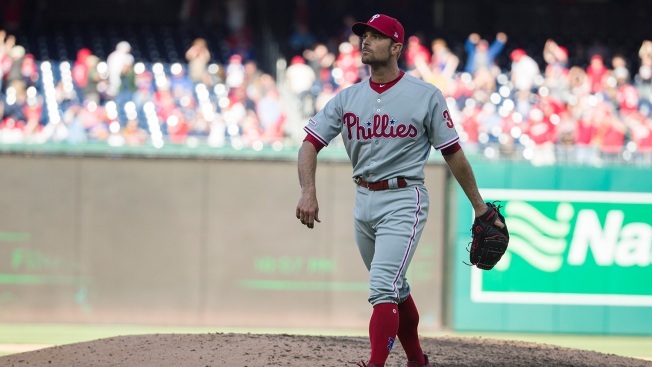 One of the standouts in the Phillies' 14-inning victory over the Miami Marlins on Sunday ended up on the injured list Monday. Reliever David Robertson, who pitched two scoreless innings in the marathon win in Miami, was placed on the IL with soreness in the area of his right elbow/forearm. The Phillies recalled right-hander Drew Anderson from Triple-A to take Robertson's roster spot. Robertson, 34, said he's been treated for soreness in the area off and on since spring training. It intensified after Sunday's game. He will have an MRI on Tuesday. "I've been trying to gut it out and pitch through it, but I've kind of gotten to a point where I don't think I'm capable of going out there and doing what I need to do to help this team," he said. "It's kind of gotten to that point where the irritation has gotten to be a lot. I feel like I've strained something in my elbow, probably my flexor tendon, it feels like that." Robertson, in the first year of a two-year, $23 million deal with the Phillies, has never previously been on the disabled list with an arm issue. However, he has logged some miles - nine straight seasons with 60 or more appearances - and he has dealt with occasional arm soreness. "I've had a few times where my elbow flared up and was a little sore, but usually it goes away and this one's just kind of lingered," he said. "I'm not too worried about it. It's on my flexor tendon. That's where it feels like it is. I've had this issue before. It's been years ago since I've had it flare up this bad." Robertson was asked if it was unwise to have gone two innings on Sunday. "No, I don't think so," he said. "That's what I had to do. That's what I did." Manager Gabe Kapler was not alarmed about Robertson's condition. "I think the 10 days will be really good for him," Kapler said. "Let some of the soreness subside. We need him for the long haul. Given the fact that we're going to be leaning pretty heavily on him for four months, it makes sense to be a little bit cautious. He felt a little bit of soreness in spring training. He was able to fight through it all the way through and we just kind of felt like this was the right time to get him some rest." With Robertson out, Kapler will lean on Seranthony Dominguez, Pat Neshek, Hector Neris, Adam Morgan and Victor Arano in late-game situations. Anderson, who had been starting at Triple-A, will provide some multi-inning length.